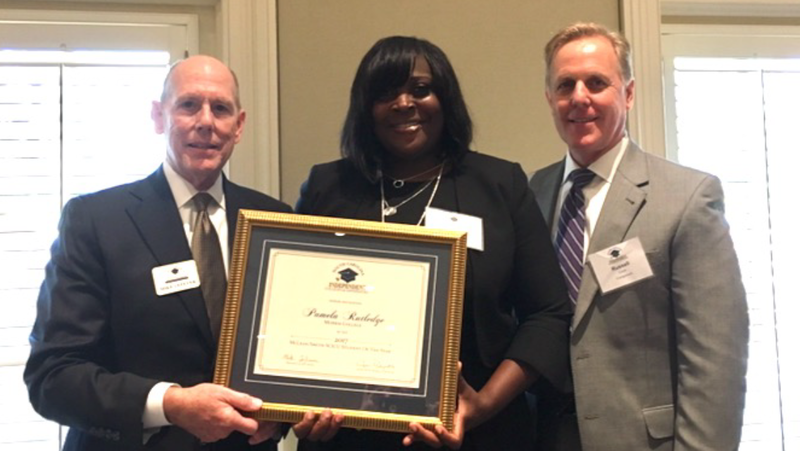 (L-R) Mike LeFever, SCICU President & CEO; Pamela Rutledge, SCICU Student of the Year; Russell Cook, Chair, SCICU Board of Trustees. Pamela Rutledge, a senior sociology major at Morris College, was announced as the McLean-Smith SCICU Student of the Year at the SCICU Fall Board meeting on September 26, 2017 at Furman University. Ms. Rutledge, a non-traditional student, is a native of Camden, SC and the mother of four children. Upon her May 2018 graduation, Rutledge intends to pursue a master’s degree in counseling and abnormal behavior at the University of South Carolina. Rutledge’s bio and award acceptance speech can be read here. Rutledge was selected for SCICU Student of the Year honors from among nominees submitted by SCICU’s member colleges and universities. The Greenville-based Center for Scholarship Administration independently conducted the nomination process and submitted the name of the award winner to SCICU. The McLean-Smith SCICU Student of the Year award includes a $3,000 scholarship. The award honors the legacy of J. Lacy McLean and Sterling L. Smith, two leading advocates of independent higher education in South Carolina. McLean advocated for independent higher education in South Carolina for over 34 years, while Smith was instrumental in the development of the SC Tuition Grants Program. The award recognizes students who perform well academically and who demonstrate commitments to public affairs, community service, and leadership. Full-time rising seniors attending SCICU member colleges and universities are eligible to be nominated for the combined scholarship award. The recipient must be a South Carolina resident and a SC Tuition Grant recipient. Rising sophomores at SCICU two-year institutions are also eligible for the award.